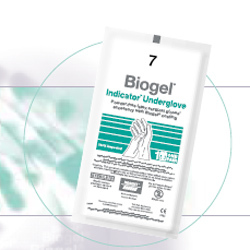 The Biogel Indicator Underglove is Biogel's latest underglove that helps you detect punctures in your surgical glove. Using their patented system, the Biogel Indicator Underglove will stain the area of the latex surgical glove that has a hole. Double gloving during high-risk procedures is not a new concept and for this very reason surgical undergloves were created. As long as one of the gloves are intact, the user will be protected. Any time the outer surgical glove becomes ripped or punctured, the surgeon can simply replace that glove with another. That is fine to do, but what if the surgeon does not realize his outer surgical glove is punctured and continues to operate? If the surgeon's inner glove becomes punctured, then the surgeon is at risk and not protected from harmful pathogens. The Biogel Indicator Underglove even helps surgeons know when their glove has been compromised by small needles. The Biogel Indicator Underglove is recommended for use when maximum protection is required, ie when working on patient with AIDS or other contractible diseases.